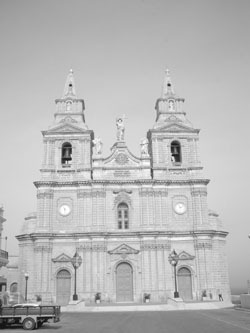 Information: Mellieha was one of the ten parishes mentioned in a document of 1436, but ceased to be a parish when the locality was no longer inhabited for fear of corsair raids; but the sanctuary of Our Lady, the oldest in Malta, remained a centre of devotion. Mellieha became a parish again in 1844. On the 5th September 1883, the Parish Priest, Rev Francis Maria Magri blessed the first stone of the new church. The new church was blessed by Bishop Pietro Pace on 5th September 1897. It was conscrated by Bishop Mauro Caruana on the 18th February 1930. Masses: Sundays and Feast Days: 6.00, 7.00, 8.15, 9.30, 11.00 a.m.; 5.00 p.m. Saturday Evenings: 5.00, 6.30 p.m. Weekdays: 6.30, 7.30 a.m.; 6.30 p.m.